Designer Laura Lee fulfilled her clients' vision - and captured their sense of whimsy - in this fashionable country club residence. 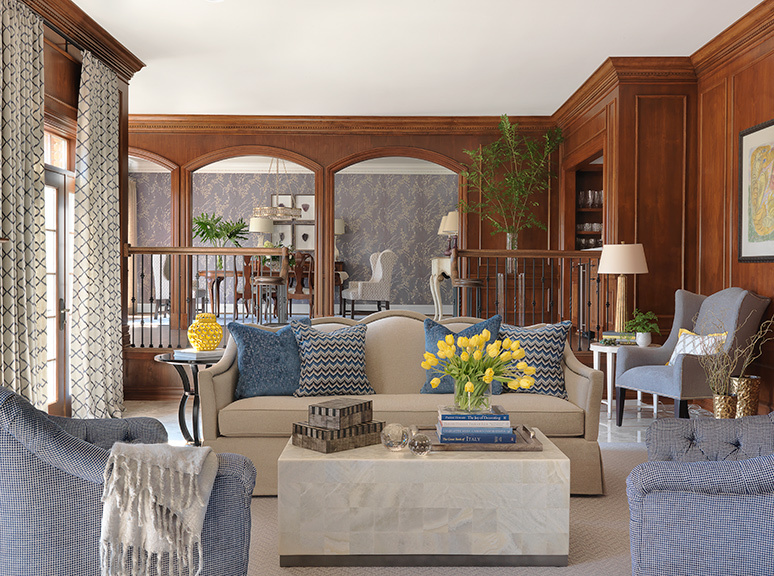 Framed in rich walnut, including the colonnade designed by Laura, the sunken living room is serene and fresh in the owner’s favorite blues and grays. Textured fabrics complement the sleek onyx coffee table, and embroidered drapes from Fabricworks line the windows overlooking the patio. 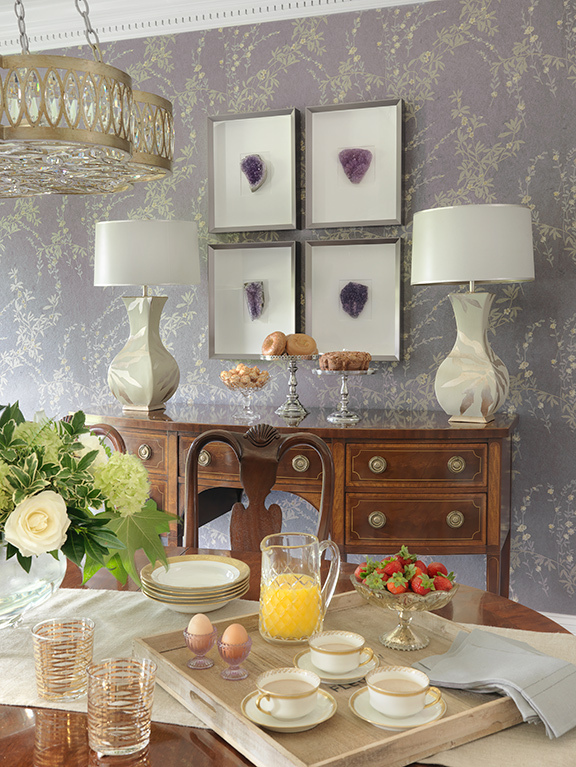 Catering to the husband’s admiration of Prince, the formal dining room features soft purple Thibaut wallcovering and framed amethyst geodes. Signed Michael J. Clément lamps bracket the traditional sideboard, and a Marquis chandelier lights the dining table. 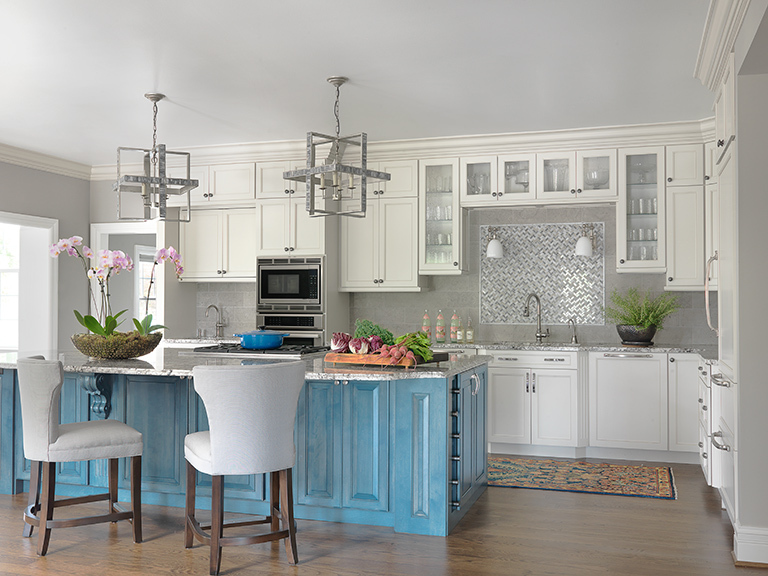 For the perfect shade of blue, Laura hand-mixed the paint and glaze for the granite-topped island that serves as the focal point of the storage-packed kitchen. The oversize, inlaid bone pendant lights were carefully chosen to match the scale of the island. Ladder-back CR Laine chairs lend cheerful color to the sun-filled breakfast room. 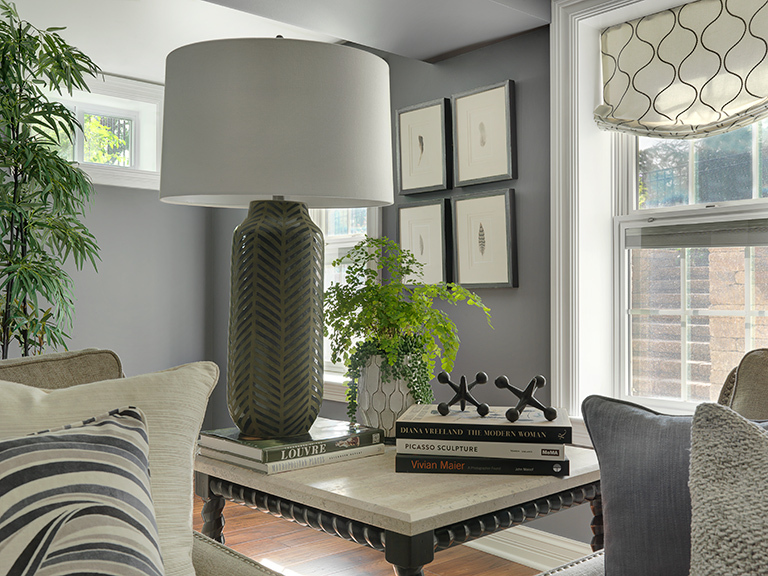 A spacious storage bench fills the window bay, and a pendant drum light in matte brass adds a soft metallic gleam. Casual yet chic, the lower-level living room is designed for durability, with fiber-sealed upholstery and easy-care floorcoverings. The oversize leather ottoman has an octagonal tray, making it equally functional as extra seating or a coffee table. 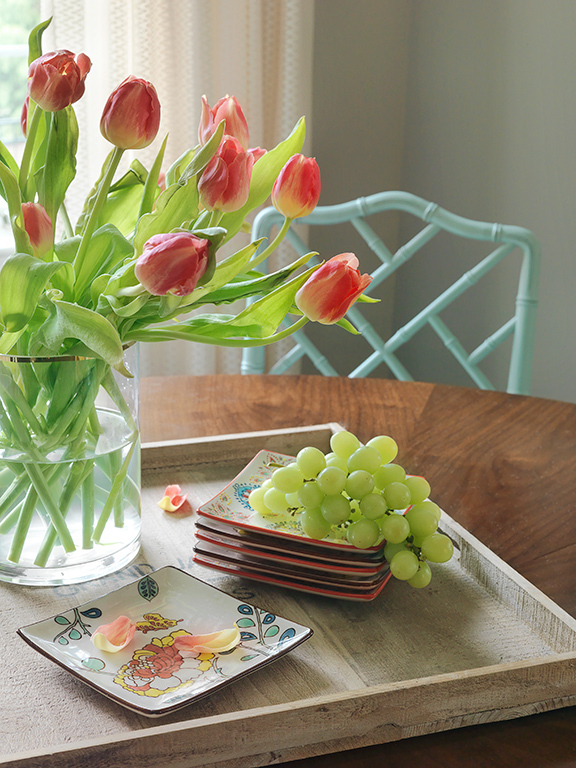 Whimsical throw pillows and decorative pieces are a reminder that this is a “fun” space. The downstairs kitchen is “entertainment central” – fully-equipped and embellished with Ice Blue granite surfaces and a wave-patterned glass tile backsplash. It was the need for more space that prompted Melinda and John Ross to start looking for a “forever” home. They loved to entertain; their two children would soon be teenagers; and they wanted to stay in the immediate near-West County vicinity. Co-owner of a commercial real estate company, John was well attuned to available properties, and the couple eventually focused on an established neighborhood adjoining Bellerive Country Club, where they were members. They purchased a 1.7-acre lot that backed to the golf course, but was occupied by a 1973-vintage home. “We knew the yard would be great for the kids, and it was big enough for a pool,” John explains. The initial plan was to raze the existing house and rebuild. Working with architect Kelly Stockie, however, it was determined that the 3,500-square-foot ranch was a good candidate for renovation and addition. Expanding with each item on the family’s “wish list,” the final design enlarged the total living space to approximately 10,000 square feet and converted the in-grade lower level to a walk-out – a project that would involve extensive regrading of the yard. Construction began under the supervision of Steve Terbrock, president of Terbrock Luxury Homebuilders, and by April of 2015, framing was completed, the roof was on, and it was time to bring in an interior designer. As luck would have it, Terbrock and Stockie were simultaneously in the process of renovating the home of designer Laura Lee, owner of Laura Lee Home, and they recommended her to the Rosses. Laura quickly grasped her clients’ objectives. “This family is all about fun,” she says. 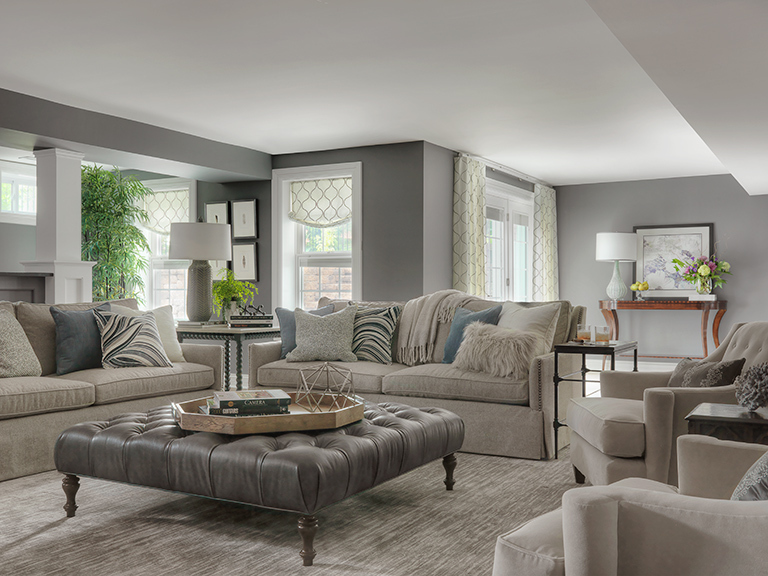 “They favor traditional styling, but comfort, functionality and plenty of storage space were definite priorities.” The designer’s challenge was to create a décor that was tasteful and elegant, yet reflective of the family’s active lifestyle and vibrant personality. After suggesting a number of modifications to the floorplan, Laura supplied CAD drawings for layout of the kitchen and, as interior construction shifted into full gear, weekly meetings kept all of the participants synchronized. Flooring throughout the main level was replaced with marble tile and oak. 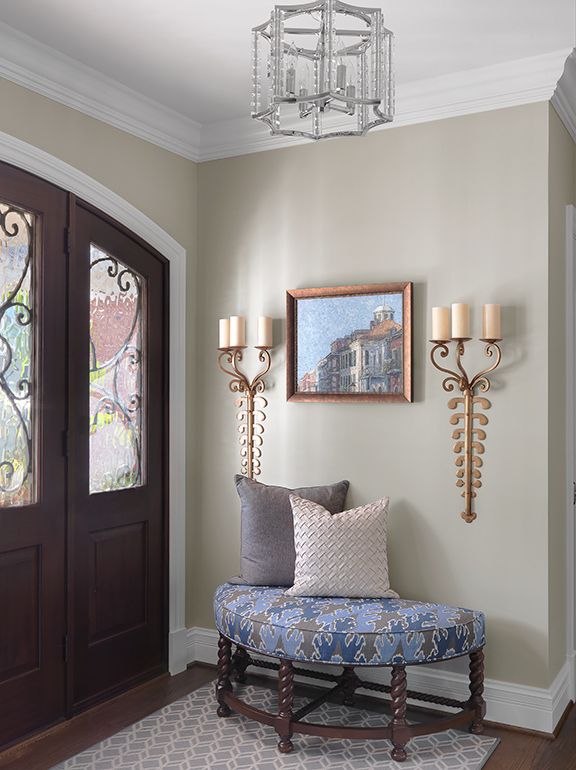 Laura designed the entry arch and colonnade that separates the kitchen, breakfast room and formal dining room from the sunken, walnut-paneled living room. Meanwhile, countless fabric samples from KDR provided ideas for the color scheme. “Melinda prefers quiet blues and grays, but John is a huge fan of the musician Prince, so she wanted to include some purple,” Laura chuckles. Together, they developed a basic palette of light, neutral hues, with surprising pops of color to give each space its distinctive character. 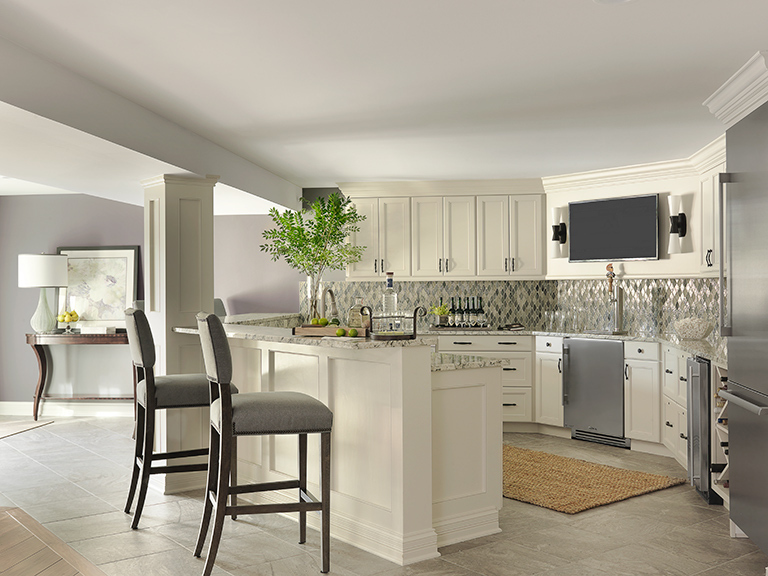 The emphasis on accent color is particularly evident in the open-concept kitchen. 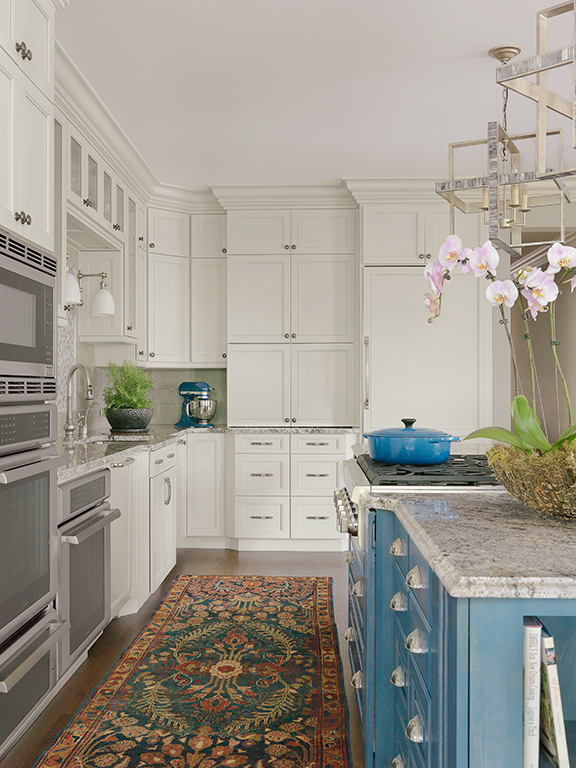 Surrounded by rich cream Amish cabinetry and a muted custom marble backsplash, Laura wanted the granite-topped, 6’-by-11’ island to “make a statement.” When she couldn’t find a blue stain that coordinated perfectly with the Blue Nile granite, she mixed the paint and glaze herself! An avid cook, Melinda was determined to have a specific storage space for everything in the kitchen. Laura responded by incorporating every imaginable convenience, from a Keurig cup drawer to spice-rack pullouts, double-decker cutlery storage and even a stepladder cabinet. In the bayed breakfast room, the sleek round pedestal table is highlighted by lattice-back CR Laine chairs in a cheerful light aqua. Anticipating the inevitable spills, the chairs are upholstered in an easy-care performance fabric and set on a durable indoor/outdoor rug. John’s affinity for Prince was subtly acknowledged in the formal dining room, which is furnished with a mahogany Queen Anne dining ensemble that had been a gift from his parents. Thibaut wallcovering in a soft purple-and-metallic floral establishes an elegant, traditional ambience for the room, and embroidered linen host chairs were added for scale and a more transitional effect. Dominated by Melinda’s favorite blues and grays, the fireside living room overlooks the patio and is ultra-comfy, with a contoured sofa in a woven linen blend, tufted swivel chairs, a laminated onyx coffee table on a plinth base and a nail head-trimmed wing chair in striated chenille. From the outset, expansion of the bedroom suites had been a primary objective, and Laura devoted special attention to the luxurious baths. A veritable spa, the master bath features an oversize, glass-enclosed shower separating the his/her vanity areas. Tiles resembling sea glass line the walls, complementing the Azul Aran granite that tops the espresso-stained Amish cabinetry. For her bath, the owners’ preteen daughter chose a lovely shade of seafoam, and Laura completed the design with fresh white cabinetry, a Fantasy Brown quartzite countertop, crystal knobs and charming sconce lighting. Feminine and sophisticated, it’s a private haven this youngster is sure to enjoy for years to come. Renovating the home’s lower level was a major undertaking. Originally below ground, the space was dark and low-ceilinged, and the ultimate solution was to lower the rear yard, allowing for a walk-out and full-length windows. Ductwork was removed to raise the ceilings, resulting in a wonderfully voluminous space filled with natural light. In addition, the entire home was automated, with all of the systems and electronics operable from a smartphone and/or installed iPads. Floor De Lis provided the lower-level flooring, which was chosen specifically by location – porcelain tile in the high-traffic and wet areas close to the pool deck and engineered wood for the gathering areas. Fully equipped with stainless appliances – from an ice machine to microwave drawers – the lower-level kitchen ensures that guests will be well supplied with food and beverages. Predominately gray (with hints of lavender and purple), the downstairs living room is furnished with CR Laine sofas, upholstered in fiber-sealed fabrics and accented with “fun” throw pillows. Velvet side chairs add texture, and an oversize leather ottoman with tray doubles as extra seating and a coffee table. For the latest in high-tech amusement, this level also features a golf simulation room.